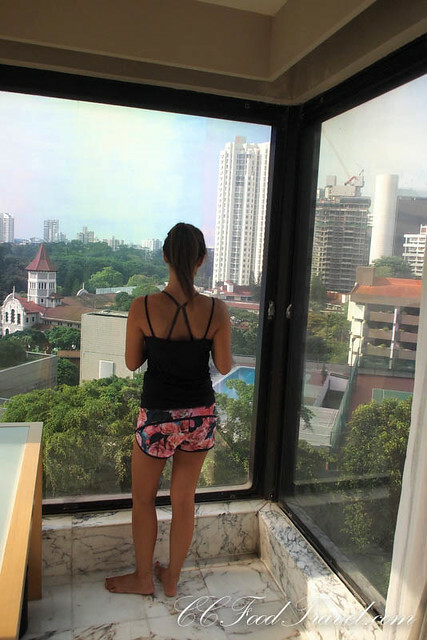 I always say that this is one of the most fabulous hotels to stay at, simply because one can roll out of bed into Orchard road and commence shopping just as easily as one can roll back to the hotel. Strategically located is an understatement for sure. The rooms of course are super luxurious – we were upgraded this time, and our room had a stunning view of the city, nice huge trees, as well as the swimming pool below. How can one resist a leisurely dip in the outdoor swimming pool surrounded by such lush greenery? 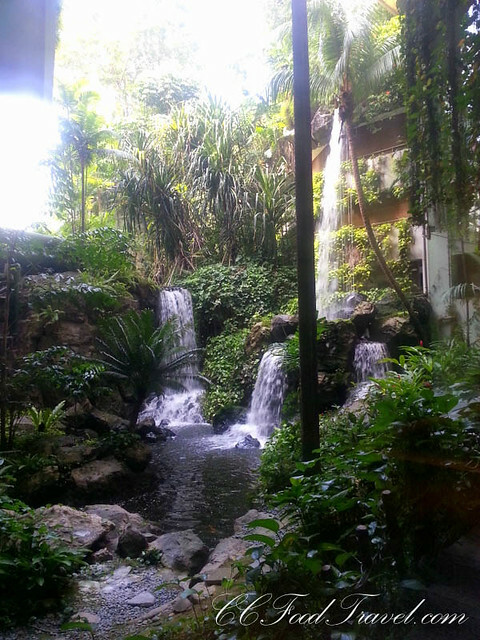 And if you have the time, I highly recommend you try and rejuvenate at Damai, the hotel’s spa and fitness centre. For sheer indulgence, treat yourself to one of the signature body and face treatments or traditional massages and be pampered into a state of lingering bliss! spacious rooms with zippy wifi & a comfy bed .. that’s all I need! I couldn’t get enough of the pool! The hotel’s strategic location on Orchard road, means it is easy enough to catch a cab or take the MRT which is a mere 1 minute walk from the hotel. And the Grand Hyatt Singapore is all about the food. From contemporary western and Asian cuisine at mezza9, to popular local delights at StraitsKitchen, you will be spoilt for choice by the wide selection of food to choose from. And martinis are a must once work is done, be sure to unwind at their glass-enclosed martini bar where Aperitifs are free-flowing. Speaking to Executive Chef Lucas Glanville, we realised that he was a huge advocate of sustainable food and this is the ideology that he practices for all the F & B outlets at the Grand Hyatt Singapore, where food is concerned. From seafood, to Wagyu beef, he manages to source all his food from reputable countries that practice sustainability. As the Executive Chef of Grand Hyatt Singapore, Chef Lucas works closely with his team to develop and introduce new and exciting dishes from time to time. With a career spanning over two decades including stints in renowned restaurants such as Browns as well as The Republic in Australia, Chef Lucas food is one of the best in Singapore. He asked me what I wanted to eat for dinner, and I promptly said, Chili Crabs! 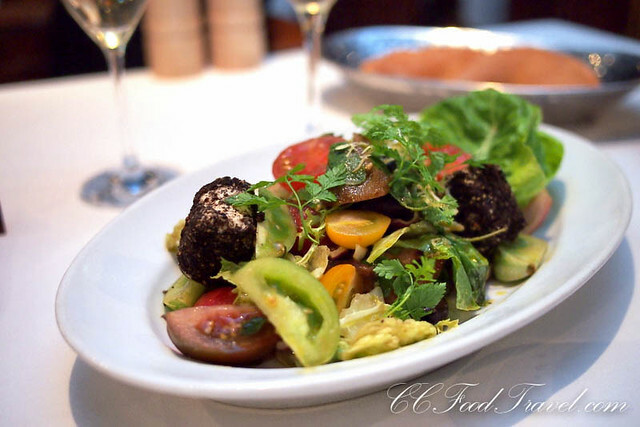 Apart from championing sustainability, Chef Lucas is also a fan of healthy-eats. He tells us about this lunch promo that they are currently having that is only 600 kcals in total calorie count. That’s right, for executives watching their weight and not wanting to be sluggish after a huge lunch, this is the ideal menu. Chef Lucas’ healthy menu helps folks on the go make healthy choices based on a menu which offers flavourful, healthy and perfectly portioned options. The Healthy Set (SDG38++) contains only 600 calories. This set includes a signature mezza9 salad, minestrone soup, char-grilled sustainable New Zealand king salmon and seasonal fruits on ice. Appetisers and mains including raw salad (mixed salad leaves, young corn, green asparagus) and portobello mushroom burger (char-grilled chicken, lettuce, tomato, onion, dijon mustard yoghurt). Opt to create your own meal by choosing a main dish, one sauce plus two sides of your choice. Sounds amazing! Too bad we didn’t have time to check this out as our stay was a short one. And right now, Grand Hyatt is having a Tasmanian promotion – The Robbins Island Wagyu and Stefano Lubiana Wine promotion at Mezza9. 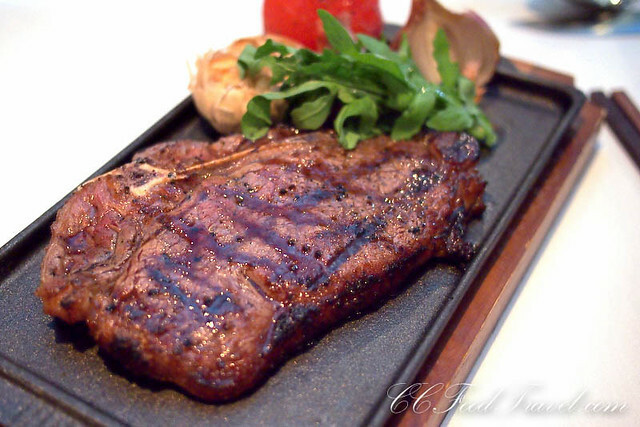 Robbins Island’s grass-fed Wagyu beef is to die for! Raised on the world’s cleanest air, Robbins Island Wagyu herds graze on the lush pastures at the North Western tip of Tasmania. This grass-fed Wagyu has an exceptional and unique flavour, the best that I have tasted as it features very fine marbling (5-9), paired to perfection with a select range of sparkling wine, Pinot Noir and Merlot from Tasmania’s first certified organic vinyard Stefano Lubiana. The beef itself has received national awards at tasting competitions (Paddock to Palate), is tender, juicy and has an enduring taste that is unctuous and sublime. Cattle from Robbins Island graze naturally and sustainably on grass, which results in a meatier taste and increase tenderness. Grass-fed cows are shown to contain elevated concentrations of Vitamin A, beta-carotene and alpha-tocopherol – essential nutrients that are known for their antioxidant properties. And of course, the perfect steak calls for a perfect wine pairing. Stefano Lubiana, the first certified organic vineyard in Tasmania, creates naturally well-balanced wines which complement Robbins Island Wagyu. 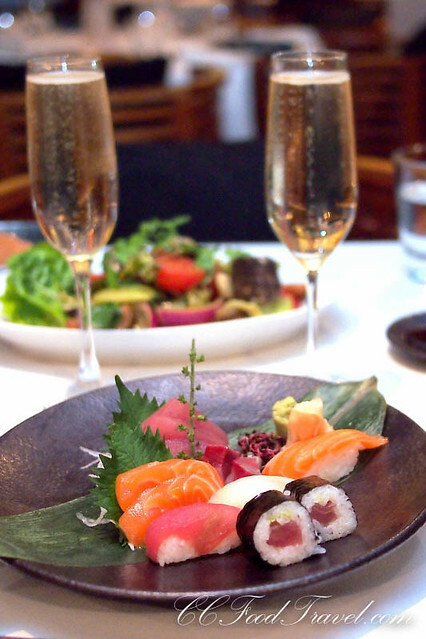 You may choose to pair any of the dishes with the Brut Non Vintage, Estate Pinot Noir 2013 or the Merlot 2008. And OMG! 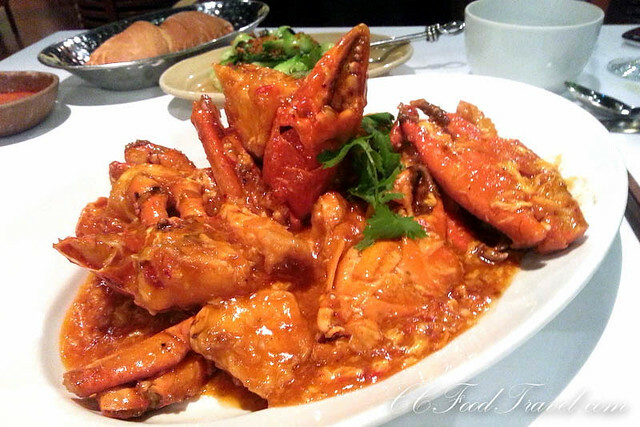 The chili crabs at the Grand Hyatt Singapore are to die for. 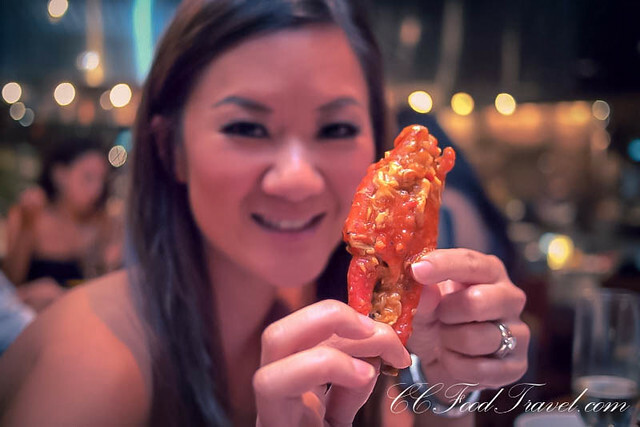 Yes indeed, here is the man-versus-beast slopfest aka Chili Crab! A nice, huge plate of deep, murky, bright-red chili sauce out of which several Sri Lankan crab legs and shiny bodies protrude. Hubby does not like eating crabs as he says that it’s an awful lot of effort for not much payoff. I on the other hand, can see past all that hard work and fix my eyes upon the prize at the end – a thick, sweet slab of taut, succulent protein protruding from a claw that I just hammered to death. Who cares about my chili-stained hands.. it was worth the battle, I tell you! The sauce was perfect – slightly sweet, mostly savory, tons of garlic and with a nice chili kick. Loved it. 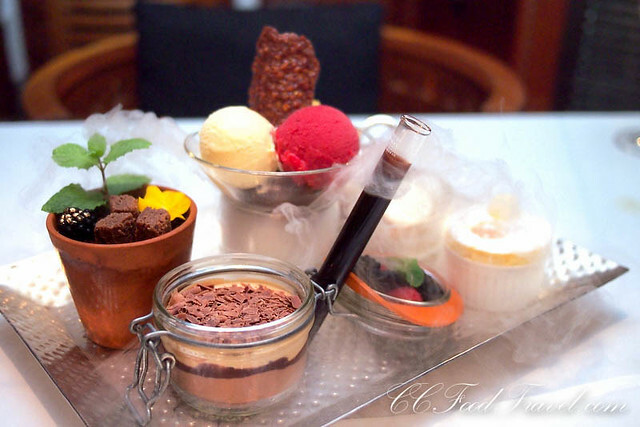 A rather molecular looking tray of some of the most stunningly plated desserts I have ever seen, arrives and I am sorry to see dinner come to an end. 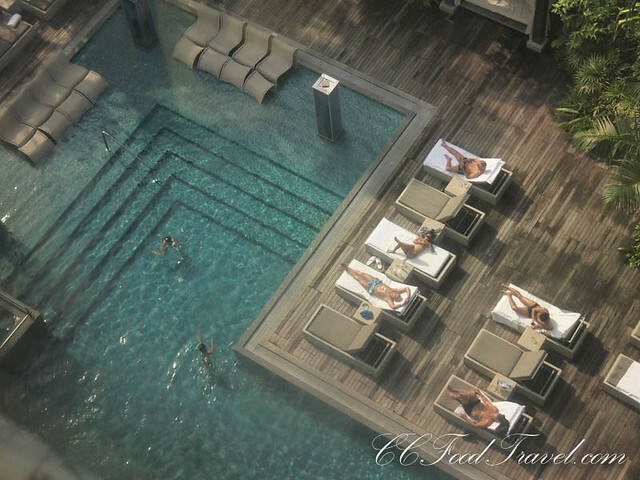 Whether visiting Singapore for business, pleasure or a little of both, the Grand Hyatt Singapore hotel has everything needed for a truly memorable stay! 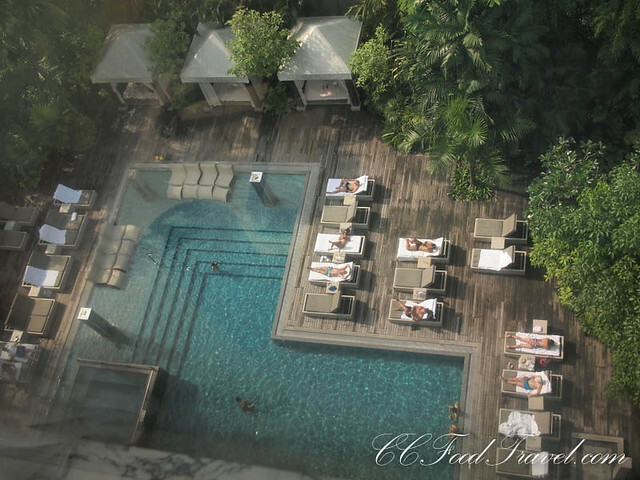 Definitely one of my Top 5 hotels to stay at in Singapore! I do like the look of all of those trees and greenery. Love that about Singapore. Yes.. which KL was more like that.. instead of cutting down trees.. pfft..